For the Russian Tea Cakes pictured, I used pecans (traditional). I call the chocolate version NY Snowballs because of their less than pristine appearance with chocolate peeking out of the powdered sugar dusting. If you really have a sense of humor (and want to delight children), roll the chocolate version in sweet ground chocolate such as Ghirardelli’s and call them Deer Poop. Beat the butter in a large mixing bowl with an electric mixer on high speed, for 30 seconds. 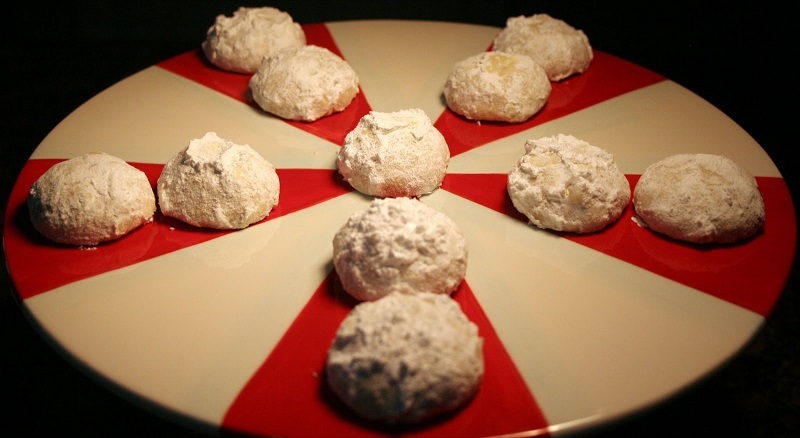 Beat in ½ cup powdered sugar, (cocoa powder if making NY Snowballs) and vanilla until well combined, scraping the sides of the bowl occasionally. Add the flour mixture and beat until just combined. Add the nuts and beat until just incorporated. Preheat the oven to 325º (Same for convection). Form the dough into 1” balls. Space 1” apart on a sheet pan lined with parchment or silpat. Bake until just firm to the touch and the bottoms are lightly browned, about 20 minutes. Transfer to a rack to cool slightly. Roll in powdered sugar. Repeat powdered sugar roll once the cookies are completely cooled. Store in an airtight container.